Safety Always exercise proper safety measures. In many brush applications, the material being removed or cleaned tends to fly off the brush during machine operation. Protective gear such as safety goggles, protective clothing or face shield should be worn by operators. 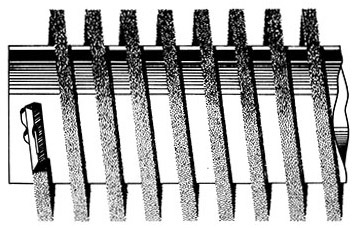 RPM In general cleaning applications, the brush surface speed should be approximately 3 times the belt speed and rotating against the direction the conveyor is traveling. But remember, faster is not always better, it just wears the brush out quicker. Material 1) In most applications, using just the tips of the brush filaments and the lightest possible pressure on the brush is most effective. 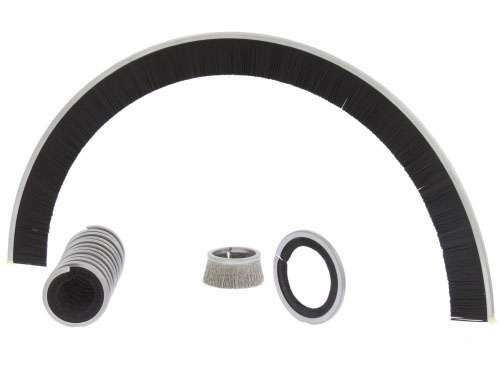 Excessive pressure causes wire filaments to fatigue and synthetics to wear down, both shortening the life of the brush. 2) It is the nature of crimped filaments to be more bushy and create a larger brushing surface area with fewer number of filaments than that of level filaments. Whereas, level filaments create a more dense brush with a larger number of filaments to make a reduced brushing surface area. 3) Picking the correct filler material for the brush application is critical. See the material characteristics page or call Power Brushes, Inc.. for recommendations. 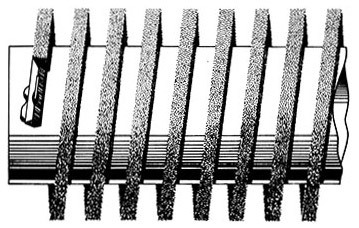 Helix Coil Brushes can be made with a left or right hand helix. In most applications the helix has no effect on the end result. If you have a preference please advise us. Brush Care Keeping brushes clean by use of a beater bar, water flow, or in co-operation with a vacuum, aids in debris removal and increases the efficiency and performance of the brush.